As I reflect back on the times in my life when I was driven towards a particular goal … be it writing my first book or starting my business, I was always crystal clear about the why behind my actions. I had a clear understanding of my purpose for that particular goal and was driven to achieve it. When I look at the times in my life when I wandered, was unproductive, or did not produce my greatest work, it is clear to me that I was simply stuck in the how and what of a project, body of work, or the situation at the time. I was missing the emotional connection to the purpose, I was missing the why behind my actions and so without clarity I was unable to focus and as a result my energy was scattered which left me less efficient with my resources and less effective with my results. 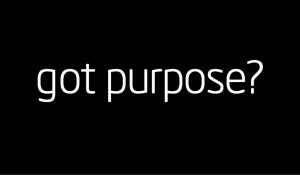 So how is it that one can be led to finding purpose in work and in life? At first the question in and of itself can seem overwhelming … however it really doesn’t have to be. When you think about the work you are currently doing, the people you are leading, the reason you are drive 45 minutes one-way into work each morning … are you crystal clear about the purpose behind doing what you do? Is there a clarity of purpose that stirs the passion inside of you and drives you to move towards creating work that is bigger than yourself? Sometimes you have to look beyond to what is right in front of your face and focus on the end result that you want in order to get clarity. Maybe it is providing for your kids, to do for them what your parents did or didn’t do for you. Maybe it is to make sure that each day you walk away from your work knowing that you did your best work. Maybe your work will provide the resources to fund a dream to stop working in 4 years, to retire in a log cabin in Colorado. Or maybe you are a leader and you know your work is to influence others around you to do or to be their best … which is how I am redefining leadership. Without the why … the how and the what don’t matter. Discovering the why behind all of the how’s and the what’s of your actions … may just lead you to your purpose? Start with the end result and work your way back … you may just realize that your purpose has been there all along! PreviousPrevious post:How Do You Make a Big Decision?NextNext post:10 Things You Need To Let Go Of … Right Now!